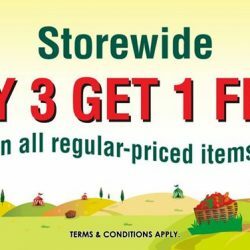 Storewide "Buy 3 Get 1 Free Regular Priced Items" promotion now on, till 31 July 2016! Promotion is applicable in The Cocoa Trees outlets (excluding Airport, Warehouse outlet and Atriums). Terms & Conditions apply. 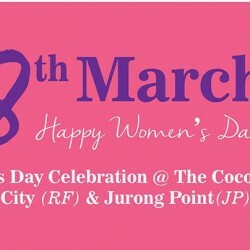 The Cocoa Trees is celebrating Women's Day on 8th March! Receive a stalk of Ferrero Rocher Flower and a $10 The Cocoa Trees Gift Voucher if you make a purchase between 1 to 8 March 2016 at either our Raffles City or Jurong Point outlet. Members who are awarded the redemption and dressed in PINK will also get a chance to enter into a lucky draw to win a hamper worth $250! 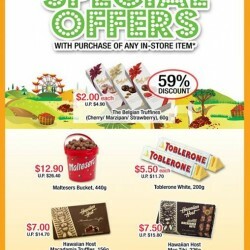 Enjoy and grab chocolates to brighten up your midweek. Head down to thier stores and enjoy these great grab deals. 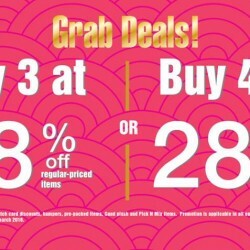 Grab deals Buy 3 at 18% OFF or Buy 4 at 28% OFF. Term and condition apply. Enjoy The Cocoa Trees' limited time promotion with up to 28% off regular-priced items, now available at The Cocoa Trees outlets. Drop by their stores for some last minute Lunar New Year shopping! Promotion till 29 February 2016. For every $28 nett spent, receive a Lucky Discount Scratch Card up to 48% off regular-priced items on your next purchase! Enjoy Members Exclusive! Free Christmas carrier bags with $50 spent in a single receipt. Terms and conditions apply. While Stocks last. 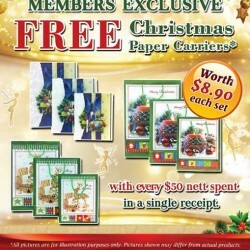 Free Christmas paper carrier will be in set of 3 of the same design. 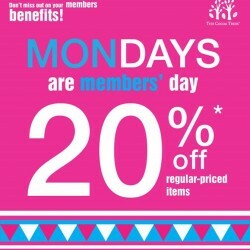 Get 20% off regular-priced items on Mondays, exclusively for The Cocoa Trees members. Don't miss out on your members benefits! Other terms and conditions apply. Enjoy and get up to 20% off regular-priced items on Mondays, exclusively for The Cocoa Trees members only. 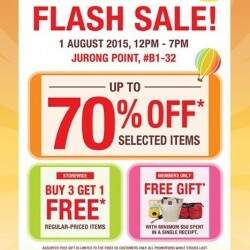 Join Flash Sale at The Cocoa Trees Jurong Point where many items will be on great discount! 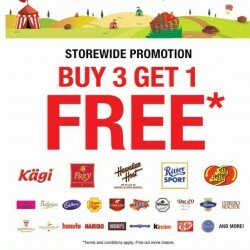 Plus, storewide Buy 3 Get 1 Free. Terms and conditions apply. 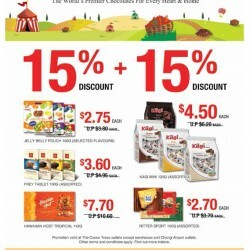 Enjoy and get 15% + 15% off your favourite products at The Cocoa Trees from now till 16 July. What's more, get 2 Free Ritter Sport Squares with every 4 purchased when you flash this page. so hurry grab a great deal today! Enjoy 15% off plus 15% off at The Cocoa Trees. Purchase 4 get 2 free Ritter Sport Square (assorted) from 9th until 15th July 2015. Cut-out coupon available in today's paper dated 9th July 2015. So, come and hurry! Hurry! 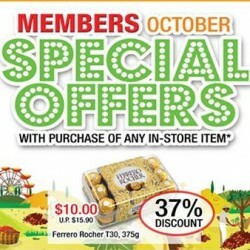 storewide buy 2 get 1 free for members @ The Cocoa Trees. So, see you there guys! Enjoy 15th birthday celebration. The world’s premier chocolates for every heart and home, $15 sweet deals @ The Cocoa Trees. So, come and hurry! Venue: The Cocoa Trees outlets except warehouse and Changi Airport outlets. 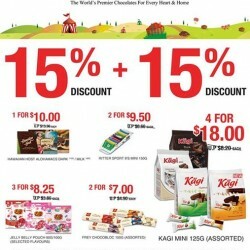 Enjoy up to 15% plus 15% off sale @ The Cocoa Tree. So, what are you waiting for? Come and hurry! 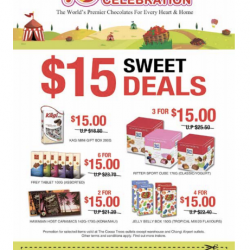 Enjoy with this 15th birthday celebration the world’s premier chocolates for every heart and home and buy 3 get 1 free promotion so what you are waiting for? Come and grab now!. For the most important lady in their life: Enjoy 20% off selected Ferrero Rocher at The Cocoa Trees (except Airport Transit outlets) + FREE Gift Wrap from now till 10 May 2015. While stocks last. Check in-store for more information. 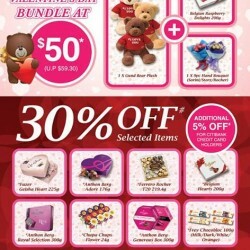 The Cocoa Trees has put up a special bundle which consist of a 9 pc chocolate bouquet, a bear and a box of chocolate for your sweetheart. Each Valentine's Day Special bundle is now going for a special price of $50 (UP: $59.30). Available at The Cocoa Trees outlets except Changi transit stores, while stock lasts. The Cocoa Trees offers a Tupperware One-Touch container at $3 each with $50 nett spent. 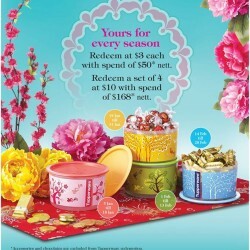 Receive a set of 4 Tupperware One-Touch containers at $10 with $168 nett spent. 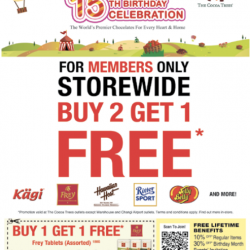 Scratch & Get Lucky this Lunar New Year at The Cocoa Trees! 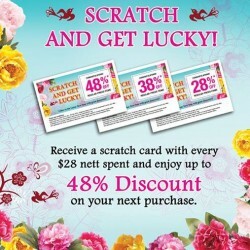 Get a scratch card with every $28 spent and get up to 48% discount on your next purchase! Promo till 28 Feb 15, not valid at Changi Airport transit outlets. Terms & Conditions apply. 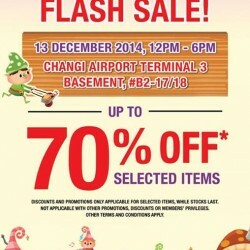 Join The Cocoa Tress this Saturday, 13 Dec, at Changi Airport Terminal 3 for Flash Sale up to 70% off! 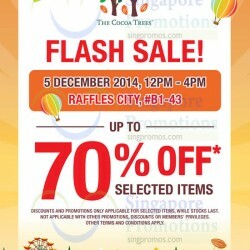 The Cocoa Trees will be having a Flash Sale at their Raffles City outlet on 5 December 2014 at their outlet at #B1-43 from 12pm to 4pm. Enjoy up to 70% OFF selected items. Discounts applicable only for selected items. The Cocoa Trees 2014 Holiday Collections. 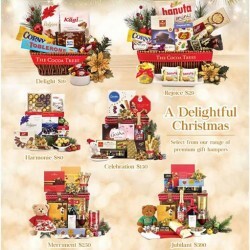 Select from the range of premium hampers starting from $19, be it a gift for home or office, it is bound to delight. Attention for The Cocoa Trees Members! Get savings of up to 59% on November's Special Offers. Trick or Treat? Its all treats at The Cocoa Trees this Halloween. Get a Free Treat Bag with a min spend of $25 in a single receipt. SPOOKY TREATS at The Cocoa Trees this Halloween! 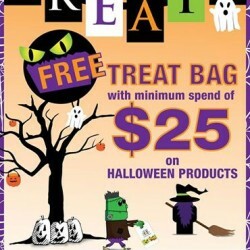 Get a Free Treat Bag with a minimum spend of $25 in a single receipt on Halloween Products. Promotion valid from 1-31 October 2014. Not applicable with other promotions, discounts or members' priveleges. Cocoa trees October Member Special Offers: Get to enjoy up to 37% off your favourite products, with any in-store purchases! Offer valid till 31 Oct 2014, while stocks last.